Shamanic work can be informational or healing sessions. In many cases, they are both. For those who only want brief direction into an intention, a Soul Reading is appropriate. For those seeking a shift in their life force, Shamanic Healing sessions are offered. Contact Kelley to book sessions. Live sessions are done via Skype, Google Hangouts, or VSee. You may have to download an app to access our session, and will be emailed the link to join our session, well in advance. A Rune Reading involves Kelley drawing or casting Runes of the Elder Futhark to obtain insight into a specific dynamic, concern, relationship, etc. Rune Readings tend to be very direct and to-the-point. To get a feel for these readings, refer to The Weekly Rune. Please know that while various insights may come up, Rune Readings do not provide medical information or prescribe treatment. As well, some states require the following statement: You must be 18 years or older to use this service and all insights are for entertainment purposes only. Rune Readings are done in-person and remotely, and are 30 minutes. Contact Kelley to schedule a Rune Reading. Ever wanted your spirit guides’ take on how things are going in your life? Wanted direction on how to align more tightly with what your soul needs? These and so many other tidbits emerge in Soul Readings. They are your barometer for how things are going in your inner life, and what you can do in your outer life to express them more fully. Subscribe today, and schedule a session! A Soul Reading involves Kelley interacting with spirit guides to obtain insight into a specific dynamic, concern, relationship, etc. Most clients start with a Soul Reading when they want shamanic insight but don’t know where to begin. They generally begin with an overview assessment of karmic patterns and the current point in manifesting life purpose. Targeted insight may include life purpose, health concerns, relationship dynamics, career opportunities, meeting spirit guides, learning spiritual gifts, fetal communication, messages from deceased loved ones, fertility insight… Get a better idea of what comes up in a Soul Reading by reading Kelley’s column, Intentional Insights. Foremost, clients find meaning in life dynamics and restore a sense of purpose. Please know that while various insights may come up, Soul Readings do not provide medical information or prescribe treatment. As well, some states require the following statement: You must be 18 years or older to use this service and all insights are for entertainment purposes only. Soul Readings are done in-person, remotely, and live online, and are 50 minutes. Contact Kelley to verify that a Soul Reading is the best approach to fulfill current spiritual needs. Note that with Soul Readings there is no followup interaction at their completion. 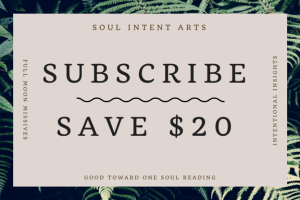 Coupons for Soul Readings can only be applied to on-site or remote sessions. Sessions at Dancing Moon can not be discounted. Shamanic Healing covers the basic criteria of a Soul Reading, though goes a step further using shamanic techniques to restore power. Whether fully aware of where healing is needed or vaguely in touch with the need, these sessions are designed to promote healing at a spiritual level. When you purchase a Shamanic Healing session, you give Kelley permission to do whatever healing is presented. In some cases healing cannot be done all at once and becomes a collaborative effort, with your input and involvement. These sessions begin with an in-depth interview to assess the dynamics around the healing need. When the interview is completed, the session is done, a writeup is emailed to you within one week after the session. If Kelley is directed to do the healing in stages with your input and involvement, she will notify as these stages occur, with the opportunity to discuss via email the process as it unfolds. Because healing often needs shorter followup sessions, this service includes followup interaction, if needed. Please only schedule healing sessions when you have two weeks free of life events, anniversaries, speaking engagements, travel, etc. These sessions require availability for you to process and communicate with me about how the work manifests. We remain in contact this whole time. Please know that Shamanic Healing doesn’t provide medical information or prescribe treatment. It is not to be done instead of other modalities, but in addition to. For that reason, please be very candid about what other treatments you are using, their timing, and progress with them. As well, some states require the following statement: You must be 18 years or older to use this service and all insights are for entertainment purposes only. Shamanic Healing is done in-person and remotely, and the initial session is 90 minutes. Mini followup sessions done within two weeks of the initial one do not require an additional fee. Also, please inquire about other in-person and distance services, such as depossession, space/land clearing, fertility consultation, other life manifestation regression/progression. Chakra Balancing is a thorough examination of the chakra system and etheric field, as well as address any needs they have using energy work to restore balance. When you purchase a Chakra Balancing session, you give Kelley permission to do whatever healing is presented. In some cases healing cannot be done all at once and becomes a collaborative effort, with your input and involvement. These sessions begin with an in-depth interview to assess the dynamics around the sense of imbalance. When the interview is completed, the session is done, a writeup is emailed to you. This writeup explains each chakra and field layer, as well as findings and healing done. Where applicable, a plan for how to maintain balance is given. If Kelley is directed to do the healing in stages with your input and involvement, she will notify as these stages occur, with the opportunity to discuss via email the process as it unfolds. Because healing often needs shorter followup sessions, this service includes followup interaction, if needed. Please only schedule chakra balancing sessions when you have two weeks free of life events, anniversaries, speaking engagements, travel, etc after the session. These sessions require availability for you to process and communicate with me about how the work manifests. We remain in contact this whole time. Please know that Chakra Balancing doesn’t provide medical information or prescribe treatment. It is not to be done instead of other modalities, but in addition to. For that reason, please be very candid about what other treatments you are using, their timing, and progress with them. As well, some states require the following statement: You must be 18 years or older to use this service and all insights are for entertainment purposes only. Chakra Balancing is done in-person and remotely, and the initial session is 2 hours. Mini followup sessions done within two weeks of the initial one do not require an additional fee. Contact Kelley to schedule a Chakra Balancing session. Payment for in-person services can be paid prior to the session, via PayPal. Accepted forms of payment include cash, and major credit card. Online transaction is the only accepted payment method for Distance sessions.